As the 18th of April passed by, I took a few minutes from my day to remember a brotha who was very close to me. My man Eddie, would’ve celebrated his 34th birthday on that day, however 11 years ago he passed away. A little over a year ago I was inspired to write about some of the moments that he and I shared from the time that we were kids. That acknowledgment was captured in a blog entry on April 5, 2005. However instead of linking the entry, I’ve decided to just repost it in it’s entirety. I sit here and reflect for a moment. I reflect upon a true friend that I lost 10 years ago today. It’s still so hard for me to believe that it’s been 10 years since his death. It was my intention to go to Ft. Lincoln Cemetery this morning as I tend to do every year on or around April 5th, but I overslept this morning and didn’t want to risk being late for work. But sometime within the next 24 hours I definitely will make my way to the spot. The spot where there is a headstone engraved with the name of my best friend Edward L. McIver. Part of me is sitting here feeling as if I’m bout to break out in tears. The other part of me can’t help but smile, as I reminisce on all the fun times that he and I shared since we were kids. He and his family from Warren, Ohio came to Maryland when I was in the 7th grade at John Nevins Andrews school. Immediately we developed a rapport that I could have never imagined. We were so much alike that it was scary. Aside from the fact that I was slightly a better ball player than him (of course he would argue that), we had a lot of common interests. Now where we differed was that he was always a top notch student and well… I was ‘somewhat’ of a slacker. 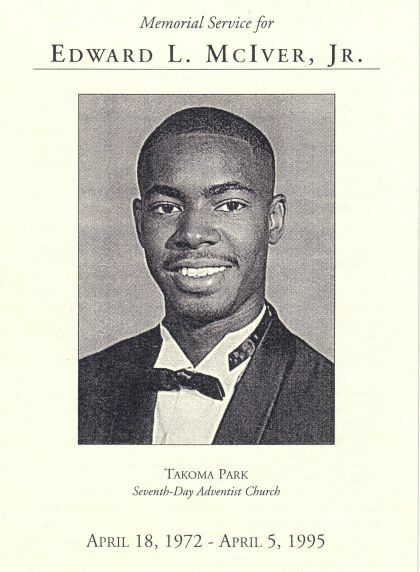 He was always on the honor roll. I never made honor roll in junior high. He tried to help me study, but I was way to stubborn… back then. As the years went by both of us and a number of other cats would hang out a lot. We would shoot ball outside or at any gym we could find, go to Landover Mall, PG Plaza or Georgetown on the regular, hit splash parties, cookouts or just cruise around the city. We attended different high schools, but always found the time to chill. I still remember how he and I rolled up in his Plymouth Horizon to see “Coming to America” and the only music we had in his car was a tape recorder. But the main thing that I never forgot is that we used to go to church together a lot. Well, let me clarify that, he used to sit in front of my Mom’s house and beep the horn ‘til I came out dressed for church. I’m talking about those mornings that I didn’t want to move. He would be like “C’mon G, let’s go” We would go to whatever church we felt like going to that particular day. He was fairly diligent in studying the Bible and I always got a lot more insight after we had discussions about spiritual things. Now with all that being said, that never stopped us from ‘creeping’ out of church during the service and hittin’ up KFC or Dunkin’ Donuts occasionally. We also would attend special evening programs or after church concerts. Now of course there would be some fine sistahs at these church events and we’d try to kick game to the ladies when we saw an opportunity. Being that he had a car and driver’s license, he had the upper hand in that scenario. I was still on the Metro bus ere’day. A few months later after my 16th birthday, he took me to MVA and let me use his car to take the test. Now, you don’t think that I failed do you? C’mon now, that brotha schooled me on how to go about the test and what to watch out for. I passed with flying colors. I went home and practically begged my Mom to let me use her ’72 stationwagon. Reluctantly she agreed and we were off to go see “I’m Gonna Git You Sucka”. I remember one night when it snowed and we both took our cars and went spinning and sliding in an open parking lot. Our parents would’ve killed us if they had seen how we were handing those vehicles. How bout the JNA alumni game where he took the opening tip, drove down the court and missed an open lay-up. Good thing though cuz he had gone to the wrong basket. He and I laughed about that moment for many many years. Anytime that the Redskins beat the Cowboys, my phone would be ringing off the hook and he’d be laughing on the other end. Of course , that didn’t happen too often, so he rubbed it in when it did. Those were just a few memories out of thousands that I have in my head. After we graduated from high school, we still kept in touch. That summer we walked around the DC area sportin’ bald heads and Champion headbands. That was the thing back then. People quite often would ask if we were brothers. After the summer was over, I left for the Navy and he left for Oakwood College in Huntsville, Alabama. We would write each other often during that time. We both went through difficulties adjusting to our new surroundings. I still have a bunch of letters that he sent me in boot camp telling me to keep my head up. A few years later when I came back home, he had transferred to University of Maryland and we were back in business. Back to hanging out, shootin’ ball and just cruisin’ the city listening to slow jams. Now things had changed a lot, both of us became involved in somewhat serious relationships and we didn’t kick it as much as we had before since we had women in our lives. 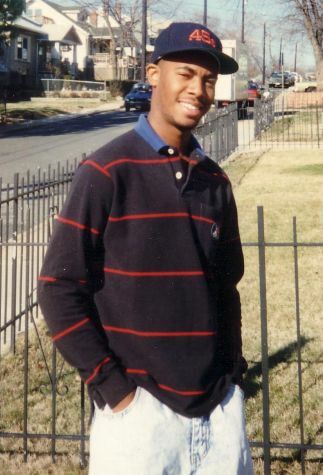 Plus, being that he was a pre-med honors Biology major, he was constantly studying and he was working at NIH. I wasn’t exactly free myself as a Regional Manager sellin’ phones for Cellular One and goin’ to school in the evenings at PG Community College. But whenever we had time, we’d hang out together with other folks and just chill. I remember being at my cellular store in Gaithersburg, Maryland when my Mom called me that morning. I remember sensing that something wasn’t right because she wasn’t talking as she normally did. I remember her telling me that Eddie had died. My heart dropped. I cried. I started hyperventilating. We discussed the details of what had happened and I was shocked. I could not believe that my best friend had taken his own life. Not my best friend! I immediately closed up shop and rushed to his mom’s house. Still in disbelief of what had happened, I drove down I-95 as fast as I could, my eyes filled with tears. I knew that there were things going on in his life, but I never ever imagined this outcome. I never thought that things would’ve gotten that bad. He and I had stuck it out all of those years and now this was happening. I had just seen him a few days earlier and everything seemed okay. We had talked about going to the Bullets game that Wednesday night. He even spoke about positive things and the desire to move forward from the difficult times in his life. I still remember our last conversation as if it were an hour ago. He said “Greg, look out for your Mom, your brother and your sister. Make sure to take care of your daughter” I was like “Cool… you know I’mma do that” Little did I know that he was leaving me with his closing. He was giving me the most positive thing that he could think of. As we got off the phone I said my usual “Peace & Love” and he said “Take Care”. I paused for a moment cuz I never recalled in 11 years him saying “Take Care”. I hung the phone up and went about my business that night. I had no idea that within 48 hours my life would change. Standing at the front of the church during his memorial service wasn't as difficult as I thought it would be. Yes, I was very sad and in a great deal of emotion distress dealing with his death, but it was easy to talk about how much fun he and I had as kids. It was like therapy for me talking about how positive that brotha was. I held back the tears and had the church laughing as I told stories of our adventures. I saw the grin on his mom's face when I talked about the silly things we did that she didn't know about. I was just there speaking freely from my heart and although it was not easy, I felt that I had to honor the man that was my best friend. It’s hard as hell for me to sit here and even say the word suicide without crying, but that’s exactly what happened. My best friend took his own life. I’ll never know why. I’ll never truly understand it. All I know is that today I’m hurting just as I did 10 years ago. To have a genuine person come into my life as a friend and lose him like that really hurts, I’ll always wonder if there is something that I could’ve said or done. I’ll always get angry when people say negative things about him or say that he punked out. That was my man. That was my best friend. I know what he was going through, but didn’t ever imagine that it would lead to this. I ask God why he allowed it to happen. Then I look back at the last 10 years of my life and realize that I’ve become a better person. But did it have to happen like this? I can’t replace him. I can’t act as if he didn’t exist. During the most enjoyable times and the most painful times of my life I wish I could pick up the phone and talk to him. Why didn’t he tell me? Lord why? I never had a chance to tell him good-bye. Not a day goes by that I don’t think of him. Nothing can take away the memories. Eddie will always be remembered in my heart because he was indeed a true friend. I now know that life is more precious than I ever could have realized. For all my brothas and sistahs who have people in your lives that you care about very deeply... Never let a day go by without telling that person that you love them.